Malaysia Airlines will be going live with a new reservations system (Amadeus) on June 10th and has decided to "improve" their Enrich award charts at the same time. This is on the heels of another massive devaluation that took place less than a year ago. As one would expect, the awards have done everything except improve in value. 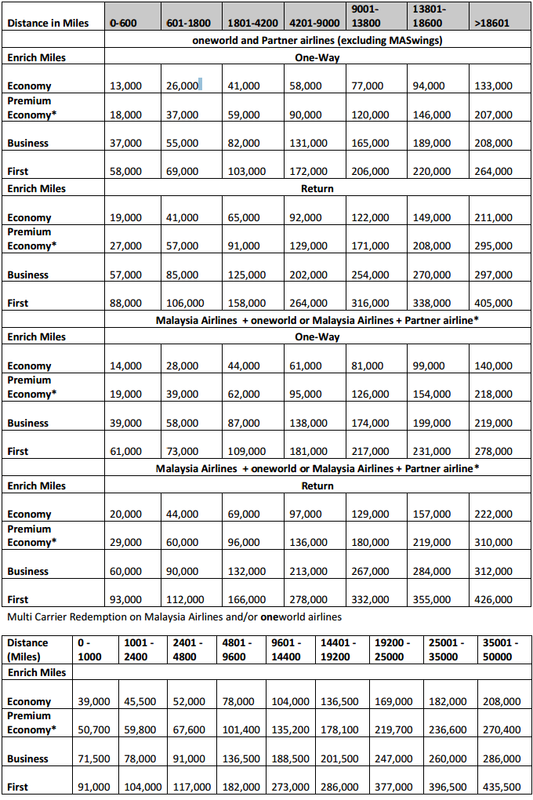 Malaysian Airlines awards on Malaysian aircraft will no longer be priced against a fixed award chart. Like Delta and others, the award prices will be based on "availability, passenger demand and seasonality." Taxes and Fees, like Singapore Krisflyer, will now be rolled into the cost of the award. Companion awards will not longer be offered. Infant Awards will now be available. Pay with Miles & Cash will now be an option. But the real kicker (and what is not mentioned in the award to members), is that partner awards, while still offered at fixed costs, have been HUGELY devalued. If only "brutal" summed up these changes. These new changes take place on June 10th so there is still time to book under the old award prices. As always, Etihad seems to have great availability ex-Australia and under the old scheme you can go anywhere in the world for at a max 87,000 Enrich miles. American Express Membership Rewards points transfer to Enrich in approximately 2 days and remember, since the Explorer card is part of the Gateway program which transfers at 4:3 to Enrich, you'll need 116,000 miles for a one-way award in business class. For my North American friends, this isn't a huge deal as your only access to these miles would have been through the Citi line of cards and their ThankYou points. As for us in Australia, the American Express Explorer card and it's recent 100,000 point offers really provided a great way of scoring a business class trip to Europe for really no effort besides day-to-day spending. For more detail please see the FAQ here.